Century Cycles announces a new service as part of our Advanced Bicycle Fitting Services: Pedal Stroke Analysis. This 1 to 1½ hour session uses the Leomo Type-R Motion Analysis System to determine things like what cadence, power, and coordinates are dead spots in the pedal stroke, as well as identify asymmetries in the pedaling motion. The Leomo Type-R Motion Analysis System uses a set of five inertial measurement sensors to measure angles of your foot, leg, and pelvis, and your pelvis's rotation and rock, and combines this data with power and cadence to create a graphic representation of your pedal stroke. This can be used to identify asymmetries between the rider and bike, strength imbalances, flexibility imbalances, and other issues. We can then identify a course of action to improve the movement. 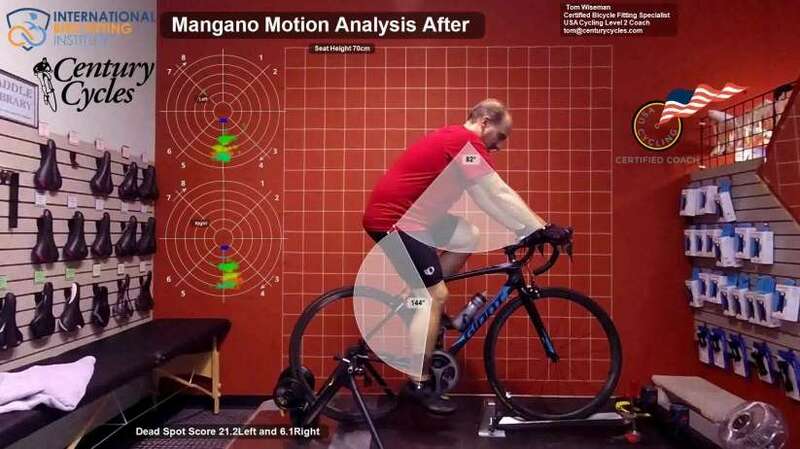 The Pedal Stroke Analysis service is provided by International Bike Fitting Institute certified bike fitter Tom Wiseman in our Medina location only. Give us a call at 330-722-7119 to discuss and schedule your bike fitting!